We aren’t sure this technically qualifies as music synthesis, but what else do you call a computer playing music? In this case, the computer is a Teensy, and the music comes from a common classroom instrument: a plastic recorder. The mistaken “flute” label comes from the original project. 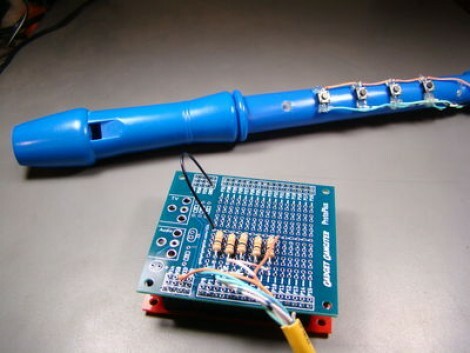 The contraption uses solenoids to operate 3D printed “fingers” and an air pump — this is much easier with a recorder since (unlike a flute) it just needs reasonable air pressure to generate sound. If you take an object and turn it into something else, does that constitute a hack? Can a musical robot call to question the ethics of firearms exports? If you take a disabled shotgun and turn it into a flute, does it become an art piece? Deep questions indeed — and deliberately posed by [Constantine Zlatev] along with his collaborators [Kostadin Ilov] and [Velina Ruseva]. The Last Gun — a mechano-robotic flute, as [Zlatev] calls it — is built from recovered industrial parts, played using compressed air, and controlled by an Arduino and Raspberry Pi. After graphing the annual arms exports from the United States, the installation plays a mournful tune for each year that they rise, and a jubilant theme for each year they fall. The latest creation in the never-ending collection of “____ Hero” instruments is this Raspi-infused pan flute, built by [Sven Andersson] and his team at the 2013 WOW Hackathon. The flute itself consists of varying lengths of bamboo from a local flower shop, cut short enough to be hand-held while still hiding the Pi from the front side. In the spirit of other ‘Hero’ instruments, the pan flute has no real musical functionality. Each pipe houses what appears to be an electret microphone breakout board, which they kept in place by sealing off the end of the pipe with glue. The sensors connect to the GPIO connector on the Raspi, which communicates to a local TCP/IP server the team ran as a controller hub. The game is also their original creation, written entirely in LUA. They turned to Spotify to find suitable material for the player to experience, creating playlists with actual pan flute songs and using the libspotify SDK to access the music. You can see the end result of the project in a short demo video below. As we wrote the title to this feature we can see why [Jeff Ledger] calls it an electronic flute and not a recorder; this is a musical instrument and not something for archiving audio. 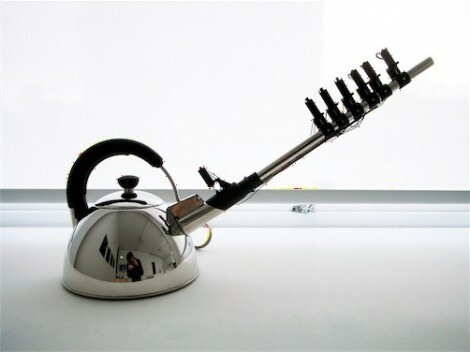 Confusion aside, we’re all familiar with these plastic ‘musical’ instruments. Many elementary schools in our area require students to buy one as part of music class. So it shouldn’t be hard to find one if you want to try this for yourself (heck, [Jeff] grabbed his a the dollar store). Basically, he’s replaced the finger holes with momentary press switches, then uses a Propeller dev board to turn the button presses into music. It’s simple and quick, but what does it for us is the breath actuator. Sure, you can set this up to play whenever a button is depressed, but [Jeff] went that extra mile and added a piezoelectric element to the bottom. When you blow through the instrument it flexes slightly, generating a tiny current that can be measured by the microcontroller. Check out the short clip after the break. Do a little more work and you could turn this into some type of musical game controller. We’re thinking Zelda!